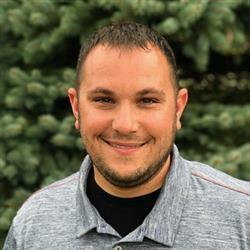 Alan Barone is currently the Marching Percussion Director and Assistant Marching Band Director at Victor J Andrew HS in Tinley Park, IL. Under his direction the Victor J Andrew HS Percussion Ensemble has been recognized as one of the premier ensembles in both WGI Scholastic A and Open Classes. The Victor J Andrew HS Percussion Ensemble affectionately known as “Andrew Percussion” has been a consistent WGI Finalist and Medalist. The ensemble was the Scholastic A Class Champion in both 2014, 2016, and silver medalist in 2011. In Open Class, Victor J Andrew HS was the silver medalist in both 2012, 2013, and the bronze medalist in 2017. In addition to his percussion duties at Victor J Andrew HS, Alan also serves as a drill writer and show designer for groups across the country. Alan lives in Lockport, Illinois with his wife Amy and their two children, Mia and Mason.